CHICAGO, Sept. 12, 2017 /PRNewswire/ -- For more than three generations, the master blenders at Suntory Whisky, the founding house of Japanese Whisky, have devoted themselves to pursuing the harmony of Japanese nature and craftsmanship. One of the most impressive examples of this pursuit is found in Mizunara, the Japanese oak. 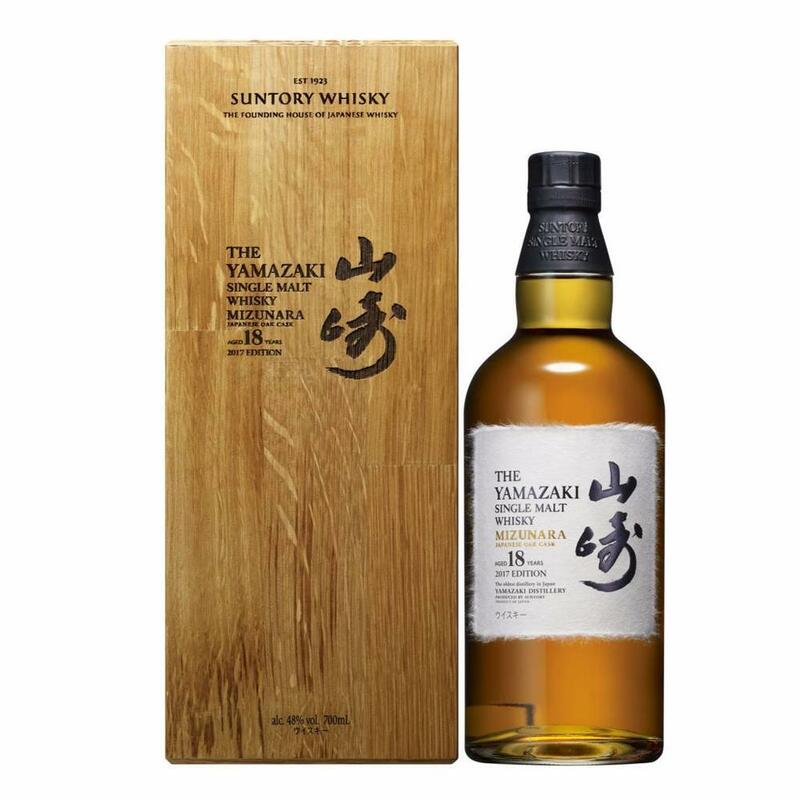 The wood from this rare and demanding tree inspired Suntory to take a momentous step forward in whisky making, both in perfecting new cask-making techniques and in creating flavors never before tasted in whisky. Suntory's blenders have brought the essence of the noble Mizunara into a peerless liquid – tantalizingly spicy, redolent of incense and uniquely Japanese. The Mizunara cask is a perfect expression of "Tsukuriwake" – the art of diversity in whisky making. Diverse grain types, as well as fermentation, distillation and maturation techniques, underpin Suntory's legendary Art of Blending. This diversity enables Suntory to produce more than 100 different malt and grain whiskies at the Yamazaki, Hakushu and Chita distilleries and allows Suntory complete self-sufficiency in the creation of its blends. It is at Yamazaki, Japan's oldest malt whisky distillery and the House of Suntory's soulplace, where the art of "Tsukuriwake" is pushed the furthest. Built in 1923 by Shinjiro Torii, the founding father of Japanese Whisky, Yamazaki produces a wide variety of malt whiskies. Only Yamazaki whiskies—and only a few—have had the privilege of maturing in Mizunara casks, creating one of the most uniquely flavored and distinctly Japanese whiskies in the world. For Suntory's fourth Chief Blender Shinji Fukuyo, every creation is a new journey to achieve the exquisite balance of subtlety, refinement and complexity that is the hallmark of all Suntory whiskies. In his pursuit of true "Mizunara-ness," he tasted a few hundred Mizunara whiskies and made selections with varying ages, from 18 years old and beyond. A very small portion exceed even 50 years of maturation, which give this limited edition an incomparable depth and a flavor that lingers long after the liquid has passed the lips. Fukuyo knew from the start that the Yamazaki Mizunara 2017 Edition was not intended for a familiar, relaxing moment. He wanted this uniquely Japanese whisky to be dramatic and unforgettable:"I wanted to reveal the whisky's soul that is the Art of Mizunara—a heightened sense and awakened palate engaged through aromas and flavors never known before. Encountering it should be a moment of epiphany." It is said that in the early 1940s, Suntory's blenders began small scale experiments with Mizunara. But it wasn't until the end of World War II, when it became difficult to import wood, that Suntory truly focused on mastering the homegrown Mizunara cask. Although only found in a few regions within Japan, it wasn't Mizunara's rarity that presented the greatest challenge to cask makers. It was the hard, permeable nature of the wood. The name Mizunara comes from the tree's high moisture content – in Japanese "mizu" means water and "nara" means oak. Its permeable character is less than ideal for cask making since liquid can easily seep through the wood. And because Mizunara is a hardwood, it can be difficult to shape and join with the precision needed to prevent leaks. Through great perseverance, Suntory's craftsmen mastered the art of Mizunara cask-making by learning how to identify the right trees to make perfectly true casks. Although rarer, Suntory's cask makers found that straight grain trees are less permeable. Trees suitable for cask making must have grown perfectly straight and have a diameter of at least 27.5 inches. They also tend to be far older than trees used in other casks. In keeping with Suntory's deep respect for the environment, trees are only cut if their removal will not jeopardize the health of the forest. Throughout their long history using Mizunara casks, Suntory's blenders have observed that age is the key to unlocking the signature taste of Mizunara whisky. A long maturation period reveals the distinctive spiciness and incense-like flavor of sandalwood and aloe wood that Suntory considers as the quintessential "Mizunara-ness." Yamazaki® Mizunara Cask 2017 Edition is presented at 48% alcohol by volume (96 proof). The bottle label is 100% handcrafted mulberry Echizen paper produced via a slow process of drying on wood boards (a traditional Japanese method). The wood box that encloses the bottle is made of cask material used in the aging of Suntory whisky.